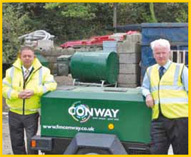 Ian Gay - Plant & Transport Director, FM Conway. September 2007. P 27 UK Home Office Report. Kosran is an engineering company and endorses the above Home Office specification. In the UK we are the industry standard and endorsed by the Top 5 Plant insurers on performance and merit. We have never had a machine bypassed and stolen. Our Kosran ’fit for purpose’ Standard demands safe and secure systems which will resist bypass and attack for a minimum of 30 minutes. Trackers real name: Asset Management. Electronic immobilisers on plant cut the electrical circuits. Without exception they can be hot-wired in maximum 90 seconds (no matter who they are certified by). They make your plant more vulnerable to theft because the operator is less vigilant parking up because he thinks the machine is secured – which it isn’t. See 1 & 2 above – won’t stop it being stolen and you won’t get it back. Kosran stops Plant Theft & Unauthorised use. We stop fatalities and make safety a priority. We have integrated machine telematics/asset management with our electro-mechanical immobilisation system. No Kosran system has ever been bypassed. CESAR is 100% dependent on enduring police diligence. CESAR provides 2 x triangular numbered stickers, one with a microdottag stuck behind it; also 2 x transponders are ﬁtted on the machine. The police have been supplied with a limited number of scanners to read and verify against the CESAR database, if the registered owner, is the one in possession. Datatag’s CESAR also provides other chemical solutions but these cannot be read by the scanner provided to the police. Kevin Howells of Datatag recently conﬁrmed that the stickers are ‘not impossible to remove’ and that of the more than 160 Cesar registered machines stolen, 45 were reported recovered. He conceded that ‘Tracking and other ID Register products’ recovered some of these. TER - The Equipment Register - has conﬁrmed they have recovered 2 CESAR registered machines from which the stickers had been removed; and tracking company Custodia Systems recovered at least a further 10 machines which had been registered with CESAR. Stats on recoveries by other Trackers are not available. See Kosran - KID ID Register... Why KID?... because its child’s play. “Kosran is the best money I’ve ever spent to protect my machines. It has saved me thousands of pounds not replacing my telehandler, downtime and cross hire”. Excerpt from failed theft report: Manitou 1030S Value: £33,000.00 belonging to Belvedere Homes Windsor Road, Gerrards Cross UK. If this machine relied on the manufacturers factory fit electronic immobiliser it would have been stolen.